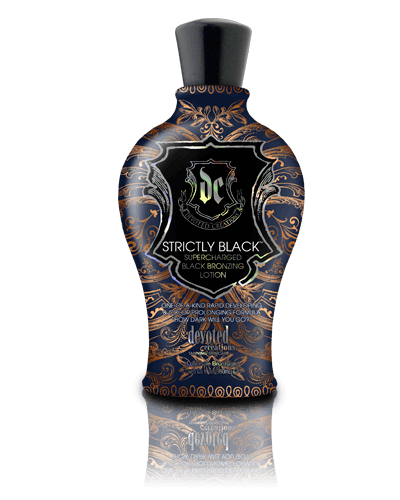 With Strictly Black™ you have hit the bronzing jackpot! This insanely dark bronzer is formulated with melanin stimulators to produce and prolong deep, dark bronzing results. Added Advanced Matrixyl Synthe 6™ and RevitaFit™ benefits make this product your go to lotion for fast visible bronzing and tightening results… Instantly! Dare to ask yourself, how dark will you go? Extremely High Levels of DHA, Natural & Cosmetic Bronzers for immediate and delayed bronzing results. Tattoo & Colour Fade Protection. White Birch – Restores firmness to the skin. Hibiscus - increasing skin elasticity to give a stunning natural youth-boost. Evens out skins tone and texture as well as helps to deeply hydrate. New C5™ - Silicone feel, without the silicone. Lightweight, silk-smooth skin conditioner that helps lock in skin’s moisture and tanning results. Tattoo & Colour Fade Protection – Protects the colour and lustre of tattoos and tanning results. Melatime™ – Stimulates melanin activity for enhanced pigmentation and long lasting results. Body Fit™ - Reduces the appearance of cellulite and restores firmness. Revita Fit™ - Tones and tightens the skin.